Contractors pouring New Concrete know that properly curing concrete increases the odds of achieving maximum long term appearance and performance – and saves potentially costly warranty repairs. 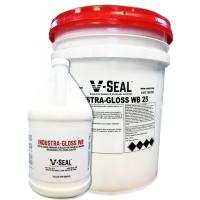 V-SEAL is at the forefront of Concrete Curing Technology with Dissipating Acrylic Cures for indoor and outdoor use and Chemically Reactive Penetrating Cures that provide perfect 2% Moisture Vapor Transmission Rates (MVTR), along with Permanently Increased PSI and 20 Year Sealer Protection. V-SEAL 101 – Indoor, machine trowel & decorative concrete. V-SEAL 102 – Broom finish exterior concrete. 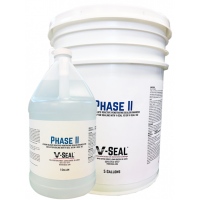 Phase II Enhancer – enhances surfaces sealed with V-SEAL. 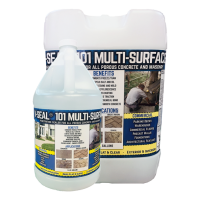 When all bleed water has dissipated and the new concrete will withstand the weight of a workman without marring, uniformly apply V-SEAL 102 with a pump up sprayer as an ASTM C309 curing compound. 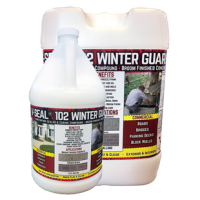 To maximize repellence of moisture, freeze/thaw, salt, and oil, anytime after 7 days, re-apply V-SEAL 102 to the point of rejection. To apply to the point of rejection, sealer should be applied until puddling occurs, then dispersed before puddles are allowed to dry on the surface of the substrate. Stripping or power washing are not required.